New Type microwave drying sterilizer - microwave frequency is 300 MHz to 300 GHz electromagnetic waves. Dielectric material is heated in water molecules are polar molecules, which in a rapidly changing high-frequency electromagnetic field, its polarity orientation will change as the external electric field changes, resulting in the movement of molecules and mutual friction, so that the material temperature increased. Achieve rapid drying sterilization effect. 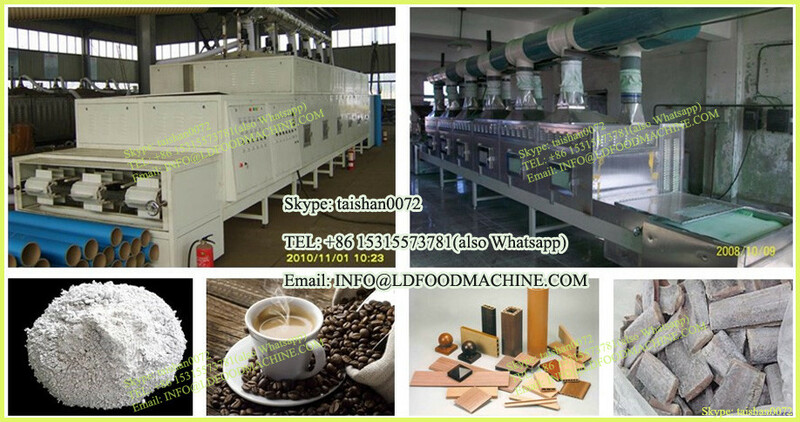 In recent years, our company developed a 6KW ~ 150KW series dedicated microwave drying sterilization equipment, sterilization due to dry quickly and evenly, energy efficient, simple operation, etc., are favored by many food companies, it has achieved remarkable economic and social benefits. 1)Tunnel-type microwave drying sterilizer is made of high-quality 304# stainless steel.Fully meet with medicine machinery requirements. 3)Penetration:Tunnel-type microwave drying sterilizer adopts radiation way to transfere energy and it heat wholly without any medium. Since established, TINDO has successfully exported its machines to more than 90 countries. With many practical experiences, TINDO can provide clients with the most effective market information and customer service experience. TINDO never stops doing market surveys and attending international exhibitions. With decades of knowledge accumulated about market information and changes in food trends, we can provide the most valuable information to our clients, and assist our clients in industrial upgrading. TINDO will respond to customer phone calls, e-mails or faxes for machinery or production problems within 24 hours to prevent a client's potential loss.